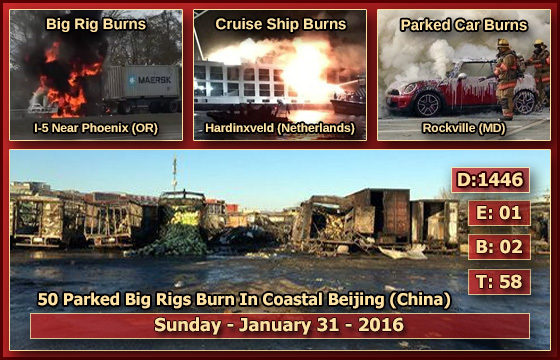 Quote: "On Jan 31, 2016, at 1 a.m. a large scale fire broke out on the 'Emerald Belle' which was actually under construction in Hardinxveld-Giessendam on the Lower Merwede. Two fire boats and shore based fire fighters were able to bringt the blaze under control. A ship which was lying beside the burning vessel was towed away by the fire rescue to prevent the fire from spreading." Quote: "The 'Bøfjord' caught fire on its way from Ålesund to Lofoten on Jan 31, 2016. The two men aboard were rescued by the lifeboat 'Stormbull.' At 11:40 a.m. the Rescue Coordination Centre for Southern Norway was notified about the fire on the ship west of Sveggøya at Averøy Nordmøre, The fishing vessel had a change of ownership and was on their way from Ålesund heading for the Lofoten when the incident occurred." Quote: "Beijing News News Today at 2 pm, the Great Ocean Road, Chaoyang District, Beijing vegetable wholesale market of agricultural area on fire, more than 50 vehicles loaded with vegetables truck was burned empty frame, serious business losses, no casualties." 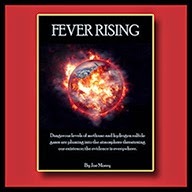 Quote: "8:00 pm, the Beijing News reporter on the scene saw the wholesale market parking area there are four rows of trucks were burned in a row..."
Quote: "A wholesale vegetable market in the Chaoyang District of Beijing burned down on early Sunday morning, destroying 50 lorries and their loads." Quote: "As of this report, the fire was confined to a tractor-trailer rig the partnership uses to transport solid waste." Quote: "A source tells the News-Times a military jet flying over the area spotted the fire and called military authorities who in turn alerted the county's 911 communication system." Quote: "Car fire in Kendal(South Lakeland) 31 Jan 2016 At 14:25 firefighters attended a report of a car on fire in Brigsteer Road. The fire was out on arrival, crews made the scene safe." 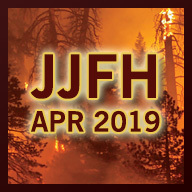 Quote: "No one was injured in a fire that burned down a detached garage and irretrievably damaged two cars Sunday evening. The fire, at 240 Oliver Lee Drive just south of Main Street near Ace Hardware, was noticed by a neighbor, who knocked on the homeowners’ door to tell them." Quote: "The fire destroyed the home and damaged a vehicle parked in the home's carport." Quote: "Mike Denny, an avid birder and past president of the Blue Mountain Audubon Society, said he’s never seen anything like the numbers of dead fish as well as the flocks flying in to feast on them." Quote: "Neither body has been identified but police do not believe the two cases are connected." Quote: "Lambton OPP are investigating the cause of a tractor trailer fire along Highway 402 early Sunday morning that left one person dead. Officers were called to the scene on the westbound 402 at the Camlachie Road overpass, just east of Sarnia, around 3:15 a.m."
Quote: "This marks the second death for the school in two weeks, after freshman Haily Hayes was found dead in her residence on campus on Jan. 17." Quote: "His family tells 13abc that his body was found in the backseat of his car, showing no signs of trauma. They say that police don't suspect drugs to be a factor in his death." Note: Had he spent any time near low-lying areas like, say, a GRAVE? Quote: "Robinson started driving a bus for Sand Springs in 2013 and was a valued employee. Reports said that Kelley, who was driving a green truck, left his lane suddenly and struck Robinson’s car on the driver’s side. '(Kelley) was foaming at the mouth and was incoherent, but we did not smell alcohol on him or anything like that,' said Sand Springs Police Public Information Officer Capt. Todd Enzbrenner." Quote: "According to Dillon, the unidentified driver said he was headed to Burger King and had suffered a seizure while driving. The man told first responders he didn't want to go to the hospital, Dillon said. But they transported him to a local hospital anyway." Quote: "A driver experienced a medical emergency and crashed into the Aldi store in Colerain Township Sunday afternoon, according to Colerain police dispatch." Quote: "Reports of a naked, bloody man walking around downtown Asheville surfaced Sunday evening. The unidentified man was seen on Coxe Avenue. According to Sgt. Cecil of the Asheville Police Department, the man was having mental issues. 'I believe he was having hallucinations,' said Cecil." Quote: "In Napier, New Zealand, police are investigating a spate of biting attacks. Which you’ll appreciate is, in the words a police spokesperson, a 'little bit weird'. Last weekend there were three such incidents." Quote: "It was the second vicious dog attack in B.C. in less than a month. On Jan. 1, a Richmond woman was bitten more than 100 times and critically injured while trying to protect her young nephew. A week earlier, on Christmas Day 2015, a Fort St. John man was severely mauled by dogs." Quote: "A mobile home fire near Mount Sterling left one person dead and one person in the hospital Saturday morning. The fire occurred on Camargo Levee Road around 5:30 AM. Neighbors reported hearing a loud explosion and saw flames coming from the home." Quote: "The 'Melbourne Strait' suffered a fire on board on Jan 29, 2016. The vessel was docked in the port of La Guaira. The fire in cargo hold 1 could be extinguished by firefighting teams." 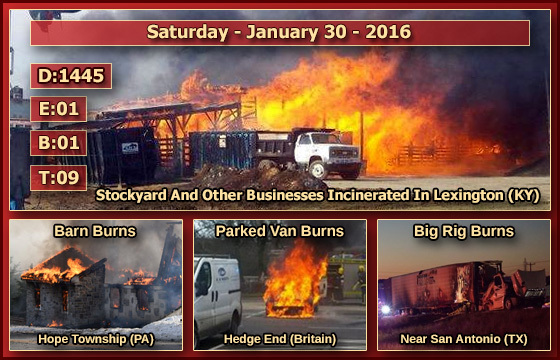 Quote: "The owner of the chicken houses, Chuck Tice, said that a tractor parked inside of the chicken house apparently caught fire, which started the blaze." Quote: "The fire destroyed the resort's general store and workshop. The general store was used for snowmobile rental and resort storage. The snowmobiles were saved, but tractor and trailer equipment were lost in the fire." Quote: "Four crews were called to the fire at a smallholding in Low Matlock Lane, Loxley, at 6am and found the barn engulfed in flames. There were some propane cylinders, a tractor, digger and sit-on lawnmower inside." Quote: "The flames consumed eight luxury cars, including two Bentleys and two Mercedes Benzes, as six other cars were moved out of the garage safely." Quote: "The house, along with a number of vehicles and jet skis, suffered extensive damage, and two houses next door were also damaged." Quote: "The house could be a total loss, Poolman said. Two cars in the garage also were destroyed." Quote: "Henson said there were no signs of injury, illness or foul play, but Chai’s body was taken for a necropsy (an animal autopsy)." Quote: "Baker celebrated his 32nd birthday Friday." Quote: "The man had no apparent signs of trauma, according to the deputy." Quote: "A farmer has been airlifted to Adelaide after having a medical episode in his plane in the Riverland. Emergency services were called to Morgan Rd, Cobdogla, around 10am, after reports a light aircraft had made a crash landing. They found the farmer in his aircraft in a paddock near his house." Quote: "Three people were killed in an airplane crash near Southwest Georgia Regional Airport in Albany. The aircraft crashed and burst into flames shortly after taking off at 2:45 p.m., WALB reported." Quote: "Police were called to the takeaway at about 5pm on Friday. A staff member from Caesars said: 'We gave him a T-shirt to wear because it was very cold. Someone called the police and he was taken away.' The man was detained under section 136 of the Mental Health Act and was taken to Royal Bolton Hospital, police said."